Miami developer Craig Robins has called on the local community to push for the construction of a car park designed by Zaha Hadid, which was rejected by city officials just weeks after her sudden death. Miami city commissioners rejected the plans for the spiralling design and voted to solicit new proposals in April, five years after the architect was hired for the project. However, Robins encouraged residents to campaign against the decision not to build one of Hadid's last buildings in the city he described as her second home. 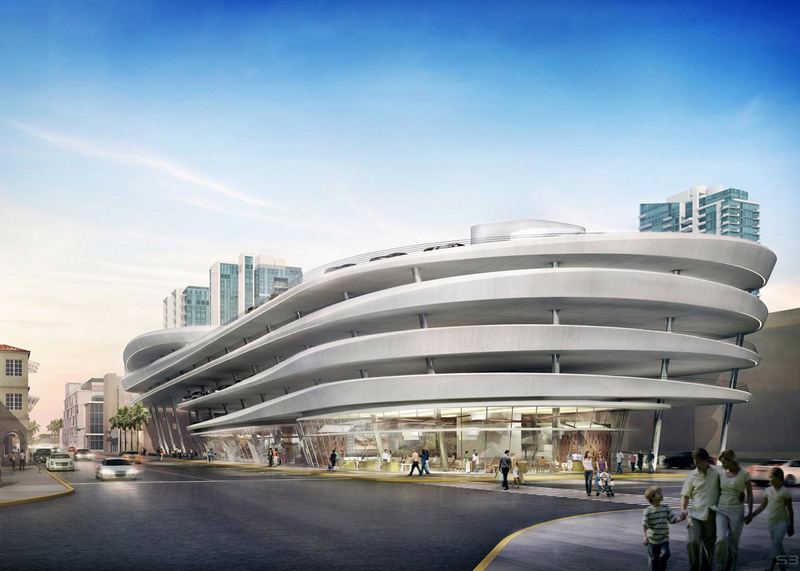 "[Zaha] has designed an incredible garage in Miami Beach, which is in question now," said Robins. "But we should lobby to resurrect it. For Miami Beach not to have a Zaha Hadid garage would be sad." The parking garage was intended to replace two surface parking lots behind the Miami City Ballet. The initial scheme was estimated to cost nearly double the $27 million (£18.7 million) allocated budget, but when the plans were scaled back to meet requirements, city officials reportedly did not like the modified design. Robins is one of Miami and Miami Beach's most influential developers. His company Dacra is largely responsible for the regeneration of the South Beach and Miami Design District areas. He was speaking at last night's awards ceremony for the Maison&Objet Americas fair, taking place in Miami Beach this week. Hadid died unexpectedly aged 65 on 31 March 2016 while in Miami, after suffering a heart attack. The Baghdad-born architect's studio was in London, but she spent large parts of the year on the Florida coast. Her 1000 Museum residential tower is also currently under construction in Downtown Miami. "Zaha really loved Miami," said Robins. "I would say that she spent a lot more time here, other than London, than anywhere else." "This was her home, she had an amazing community of friends here," he continued. "It was a place that she really came to love and it was also like she had family here." Robins and Hadid were close friends, and she even designed a bathroom at his home. In 2005, Robins presented the architect with the Designer of the Year award for the inaugural Design Miami event, which he also founded. "Zaha became a very close friend of mine, probably about 15 years ago, some time before she won the Pritzker Prize," said Robins, speaking below the Elastica installation that Hadid was commissioned to design alongside her award. Robins is the latest to pay tribute to Hadid, following Rem Koolhaas, Norman Foster and Kengo Kuma and Patrik Schumacher, among many more members of the global architecture community. Schumacher, a partner at Zaha Hadid Architects, vowed to carry on the firm without its founder following her death. Since March 2016, it has seen the completion of a maritime terminal in Salerno, won a competition for building at a technology park near Moscow, and unveiled designs for a new business district in Prague.